99% of the PowerPoint presentations you’ve witnessed are either awful, unmemorable, or both. 1% of the presentations you sat through had slides so good they took your breath away. Chances are you’re reading this post because of the latter point. You want to know exactly how the pros do it. You want to know if PowerPoint can create something so vivid, so amazing, that an audience would drop their jaws in awe. Note: PowerPoint has the potential to do amazing things, but only if you know how to approach using it creatively. In this post, I’m going to detail 4 tips that will help you design the most mouth-watering PowerPoint slides that you’ve ever created. I’ll even reference a few step-by-step tutorials that will help you get going. Whenever you fire up PowerPoint, there’s a good chance you’re going to be bombarded with different design layouts, patterns, themes, and colors. The truth is, PowerPoint’s creative suggestions are just … bad. Using them tells your audience that you have no creativity and that you’re opting for the lazy way out. All you’re doing is sending the wrong message to your audience; you don’t care about them enough to go the extra mile. An empty slide can be intimidating, but if you truly want to create the perfect batch of slides, then you need to get comfortable with making things out of thin air. Think of it this way: Leonardo da Vinci didn’t use “suggested ideas” or “stock templates” when he painted the Mona Lisa. He had an inspiration, built on it, and created a masterpiece that stood through time. Take the same approach. Look for inspiration, try and build on it, and create something magical. To illustrate this point, I’m going to show you something I transformed. This was a slide that someone sent to me, and it’s probably a familiar sight to many. It contains a title and a few bullet points. How do you even begin to look for inspiration with something as mildly designed as this? I want you to look closer at the message on the slide and truly take the time to analyze it. Two key components are prevalent. 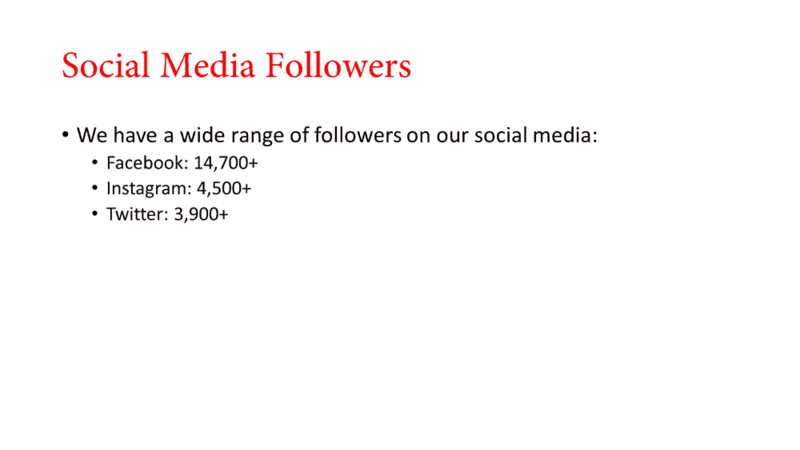 The presenter wants to list the social media metrics for her wedding planning company. The inspiration is drawn from the message. 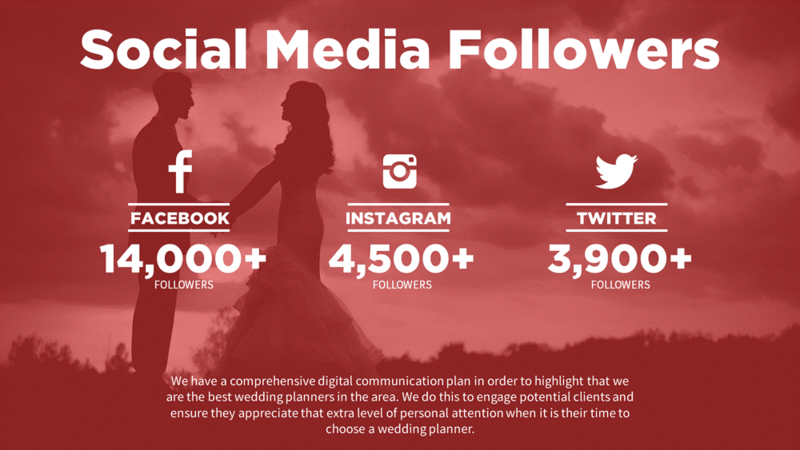 The goal now is to design a slide that expresses the strength of the wedding planning company’s social media presence. Mix in some elbow grease and a dash of creativity, and you can end up with something just like the slide below. By the way, you can watch the steps I’ve taken to transform this slide from boring to beautiful. There are tons of presentation design agencies out there that are more than happy to take your money and create beautiful PowerPoint decks. I’ve even designed some decks for some of my clients. The only problem is that the work doesn’t come cheap. We’re easily talking $1,500 and up. 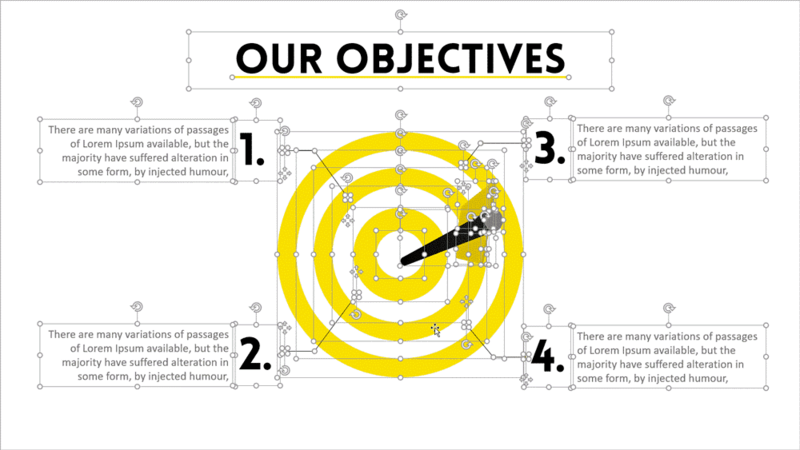 I’d only recommend sourcing a presentation design agency if what you’re making really matters. Otherwise, it’s just a waste of money. I still stand by the notion of completely ignoring PowerPoint’s stock templates and design ideas. That said, I’m all for you purchasing a premium, pre-designed PowerPoint template that can help you create gorgeous slides. 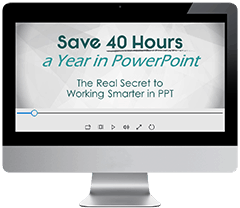 Custom-made PowerPoint templates can save you loads of time. They’re jam-packed with different slide layouts, infographics, and icons which can really enhance the message you want to communicate. If you’re looking for templates, then I have good news. My company, Slide Cow, sells premium PowerPoint templates that are beautiful, practical and affordable. We’ve already done all the hard stuff for you. Take this approach with caution though. Not all presentation templates are created equal. Do your due diligence and make sure that the template you’re downloading adds value to your message. Don’t just go for the ones that look the prettiest. When it comes to PowerPoint, less is always more. Think about it. The whole idea of giving a great presentation is to make your audience clearly understand what you’re trying to communicate. That’s what makes simple slides so effective; they make your message easier to identify, process, and retain to the masses. It’s also worth mentioning that designing simple slides means less work on your part. You can cut your workload by half by only including what is absolutely necessary on the slide, and nothing else. So, what does a simple slide look like? 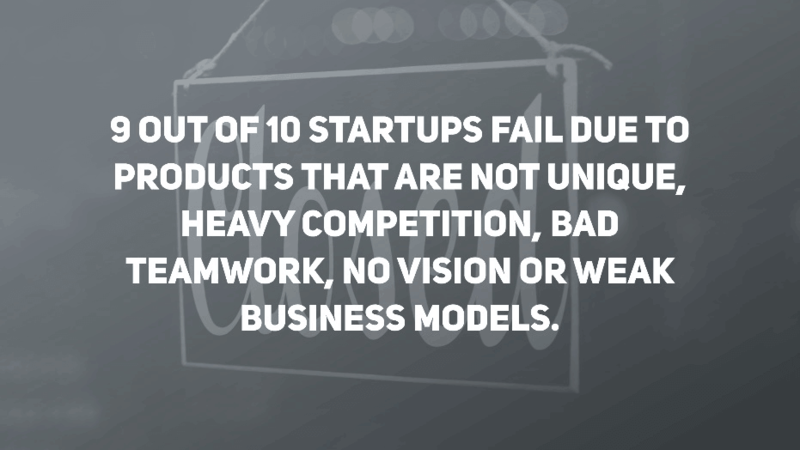 Don’t start nodding your head and claiming that you get it, because the slide above is NOT simple. The slide below, on the other hand, is. The difference is night and day. 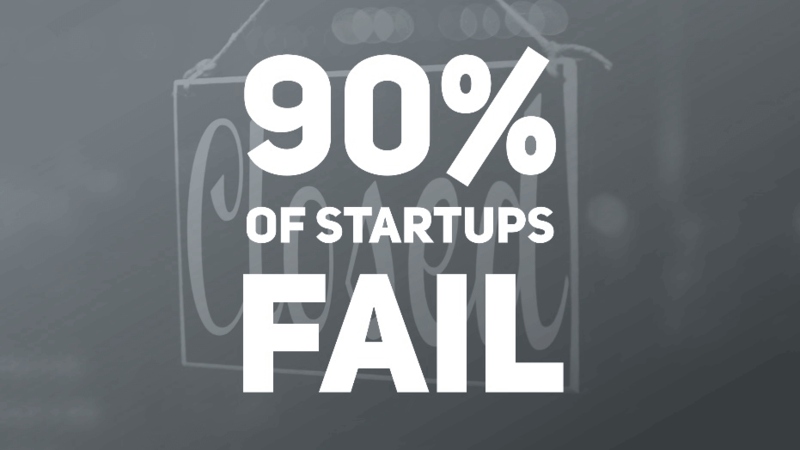 We only used a total of four words to send a powerful message: 90% of startups fail. Honestly? No. You shouldn’t. Remember, YOU are the communicator of your message. Your slides are only tools that you can use to get your message out there. It would be far more effective for you to project this slide on the screen and then verbally communicate the reasons to your audience. Think of it this way: if your slides told the whole story, then what place do you have in your own presentation? I feel like this tip should go without saying, but I’ve seen too many presenters screw this up. So, let me make this perfectly clear. Visuals help your audience remember your content and are the easiest ways to add a sense of memorability to your message. It’s not just me saying this. Presentation experts agree. Heck, even science agrees. But just because you need to add visuals to your slides doesn’t mean you should do so mindlessly. The key is to look for the RIGHT visuals; the ones that add value to your message. The right visuals are those that are both relevant to your content and appealing to look at. 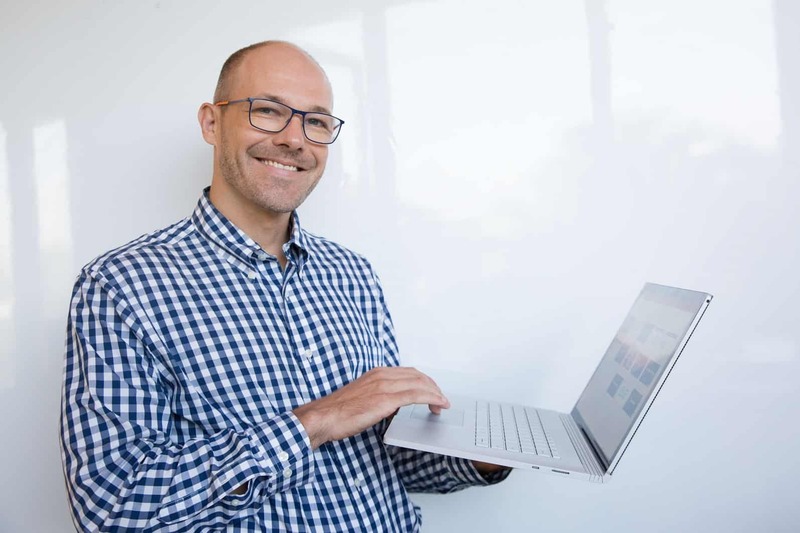 Instead of heading over to Google Image Search and going on a copy-paste spree, take the time to look for high-resolution, quality images that help what you want to say. Colors play a major role in how your audience receives your presentations. It’s not just about making them look good either, colors can even be used to sway your audience’s line of thinking. Choosing the right colors can be intimidating, but you don’t have to be expert on the subject to do it right. In fact, I’ve even made a tutorial to make this the color-selection process as easy as possible. All you have to do is spin a wheel, choose something that fits, and make the magic happen. If you work for a large organization, then there’s usually a set of branding guidelines or templates that dictate exactly what color choices you have. If this is the case, then you don’t have a lot of room to play with in terms of color choice. On the bright side, you can experiment with how these selected corporate colors can be adapted to your message. Remember, the organization you’re working for chose those colors for a reason. If you can incorporate those reasons into your presentations and explain them, there’s a good chance your superiors will love your work. 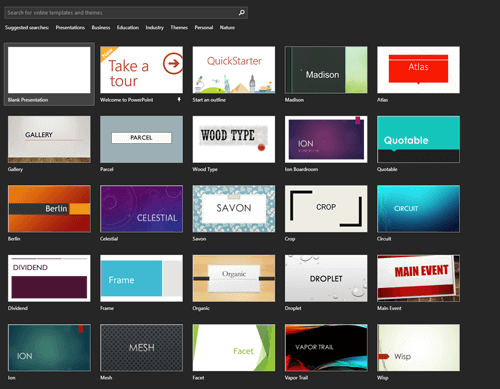 These are only some of the tips you can use to produce breath-taking PowerPoint slides. They’re not easy, and they certainly take up more of your time, but that’s the price you pay to create something amazing.